The leader of the Hezbollah terror group said Tehran had assisted it in facing off against “Zionist aggression,” during a meeting with Iran Foreign Minister Mohammad Javad Zarif on Monday in Lebanon. 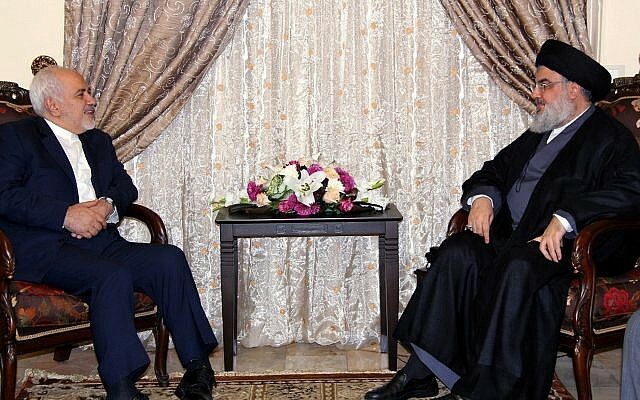 Zarif pledged continued support for Hezbollah, which has repeatedly threatened to use its large missile arsenal to target Israel, during the meeting with leader Hassan Nasrallah in Beirut, the Hezbollah-affiliated Al-Manar TV reported. “Nasrallah thanked the Islamic Republic of Iran and its officials and people for what it has offered to Lebanon, Palestine and the region’s resistance movements and peoples in the confrontation against Zionist aggression and takfiri terrorism,” Al-Manar said, according to a translation by the NaharNet website. Zarif answered by stressing Iran’s “firm stance that supports Lebanon and its state, people and resistance,” apparently referring to Hezbollah. Iran enjoys wide influence in the country through Hezbollah, which along with allied parties holds a majority in parliament. 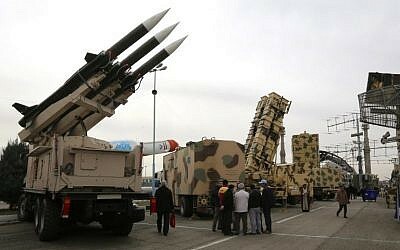 Israel has accused Iran of trying to smuggle missiles and other arms to Hezbollah, as well as technology for precision-guided rockets. It is also thought to fund Hezbollah to the tune of hundreds of millions of dollars a year. Israel has carried out hundreds of airstrikes in Syria intended to stop the transfer of weapons to the terror group. Earlier Monday, Zarif met Lebanon’s Foreign Minister Gebran Bassil, who announced that his country would not take part in a conference that Poland is holding this week on the situation in the Middle East and Iran, citing Prime Minister Benjamin Netanyahu’s scheduled attendance at the summit. Netanyahu is scheduled to take off on Tuesday for Poland, where he is set to meet US Vice President Mike Pence and Secretary of State Mike Pompeo.